Direct sunlight. Prolonged UV exposure destroys even the hardest materials. Heavy snowfall and ice accumulation.Colorado is known for its cold, snowy winters. They put a serious strain on anything located on the roof. To combat the inevitable wear-and-tear that commercial rooftop HVAC units endure, repairs are necessary. But, commercial rooftop unit repair is much different from residential rooftop unit repair. The required materials are often different, the preparation is different, and there’s a lot more planning involved. repairs required to ensure that your rooftop unit is safe, stable, and reliable for years to come. What Makes Front Range HVAC Different? 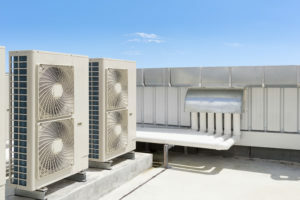 We know you have a choice when it comes to selecting the provider of your commercial rooftop HVAC unit repairs. In the decades we have been doing business in Colorado, our customers have told us time and again that it’s our expertise and quality workmanship that matter most. Other commercial HVAC contractors might cut corners when selecting the materials for the job, or they might underestimate the timeline or cost of the job. The Front Range HVAC team prides itself on providing accurate estimates and using only the highest quality materials for every job. In addition to our commitment to excellence in labor and materials, we also offer whatever help you need in dealing with your insurance company if needed. Lastly, the Front Range HVAC commercial HVAC professionals remain available to you after the repairs so that you never have to worry about where to turn if you’re not 100% satisfied. If you’re ready to hire the most qualified, proven, and capable commercial rooftop HVAC unit repair team your money can buy, contact Front Range HVAC. We’re standing by right now to start working with you to put your commercial rooftop on the road to repair. Contact us today by calling (303) 942-1372.